Collectors have obtained works of art through sales, gifts, and—less admirably—looting and plunder for centuries. The recently renovated and reinstalled Getty Villa features a new gallery highlighting the collectors who acquired ancient art. Each object in Gallery 206—titled Collecting Antiquities—was once owned by an illustrious, sometimes notorious collector. Sharing the stories of these collectors and their esteemed collections is only possible thanks to provenance research, which tracks the history of objects as they move from different owners, dealers, and museums. Documentary sources, including inventory lists, auction catalogues, and archaeological excavation records, allow us to reconstruct these trajectories. The provenance record for the J. Paul Getty Museum’s Pouring Satyr (2002.34) as shown on its online collection page. The object is featured in the center of the Collecting Antiquities gallery. From commanding statues to delicate gems, the ancient works of art in the Collecting Antiquities gallery have fascinating, oftentimes overlapping modern histories. Their stories draw upon information brought to light through the Getty Villa’s efforts to trace the provenance data for every object in its collection of antiquities—some 46,000 records!—a project that began in 2013. 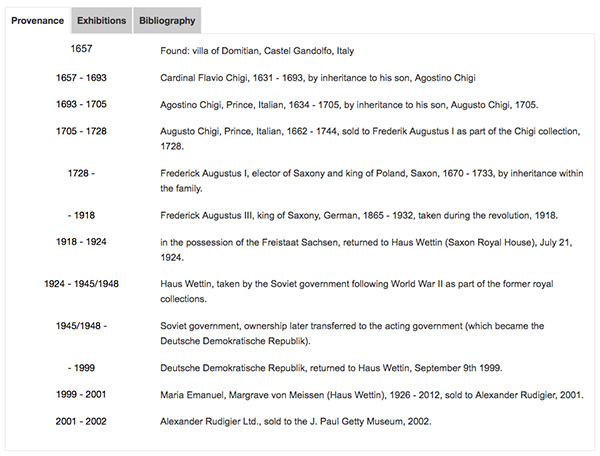 (1) Almost every online object record now provides the artwork’s known and reconstructed chain of ownership. The connections between works of art, dealers, and collectors in this gallery traverse boundaries of time and place. Each collector and every object is just one node in a network of relationships that invite further explorations. 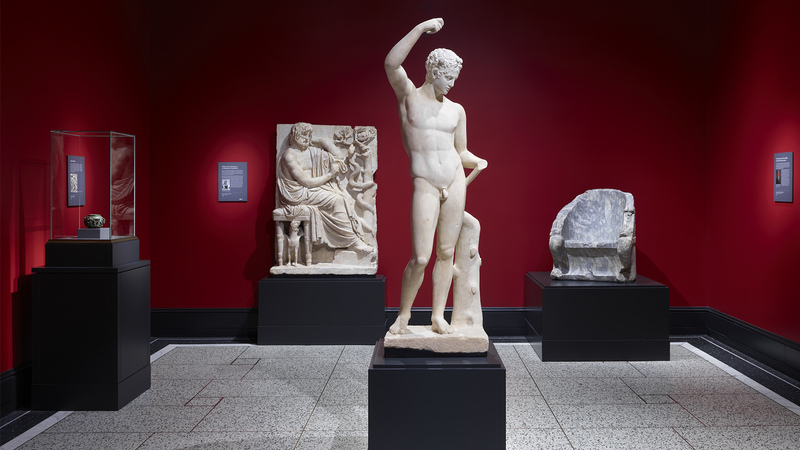 The gallery spotlights these connections by showing how collections of antiquities were formed, dispersed, and changed hands, often many times over. In the seventeenth and eighteenth centuries, wealthy, educated upper-class Europeans embarked on Grand Tours of the Mediterranean, where they witnessed excavations and saw antiquities on display in famous collections such as those of the Vatican. Inspired by the opulence of the classical world, some began to assemble their own collections, building cabinets and galleries of ancient art. Unsurprisingly, collectors of antiquities were primarily male, wealthy, and elite, and their collections were symbols of luxury and high status. 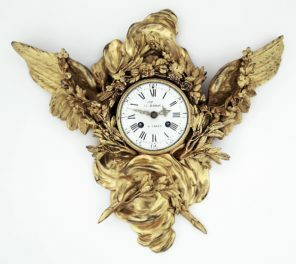 The Collecting Antiquities gallery features only one female collector, Martine-Marie-Pol de Béhague, Comtesse de Béarn. 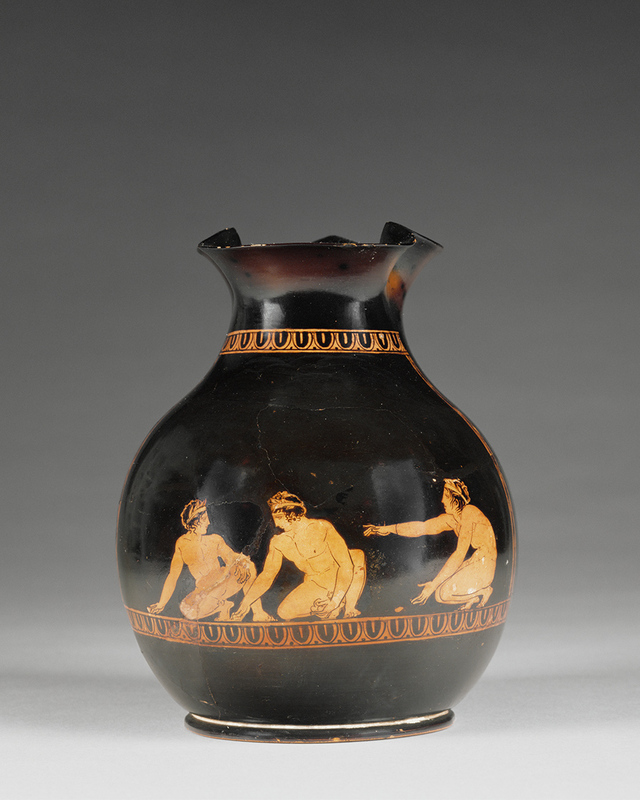 Her small chous (wine jug) with youths playing a game of knucklebones is one of several objects from this sensitive French collector on display at the Getty Villa. I’ve always loved the eighteenth-century painting of British collector Charles Townley’s home, a print of which is shown below. It serves as an evocative visual document of how collectors lived with their objects, displaying them prominently in their homes. 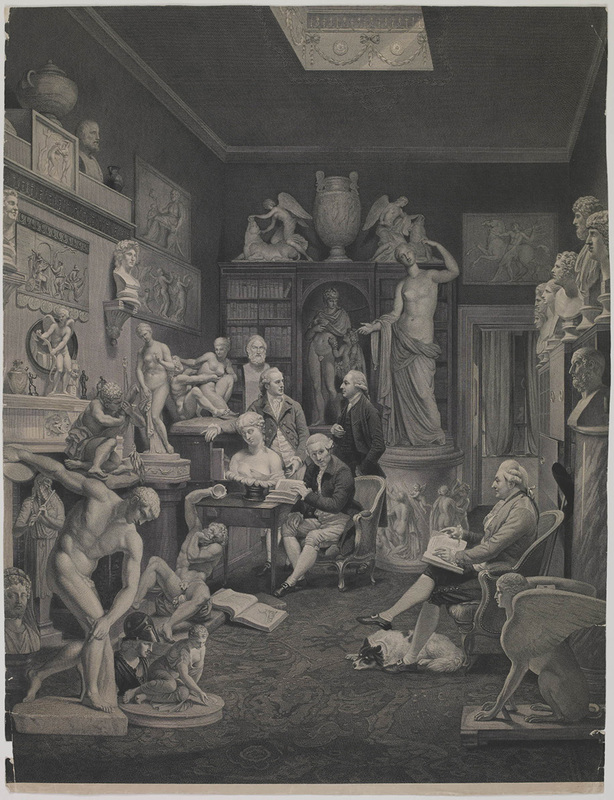 Collectors often offered public viewings and opportunities to sketch from their collections, providing intellectual edification for those unable to go on their own Grand Tours. Many of these elite collections of antiquities were later sold in the nineteenth and twentieth centuries, and provenance research enables us to track their dispersal to other collectors and museums. Stackelberg’s drawing of the Elgin throne, documenting its presence in Athens during the nineteenth century. From O.M. Stackelberg, Die Graeber der Hellenen (Berlin: Reimer, 1837). 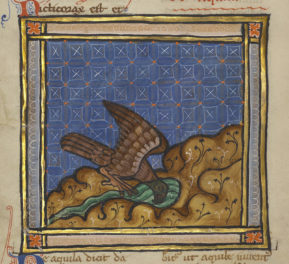 The Getty Research Institute, 93-B12781. A digitized copy is available via Heidelberg University Library. 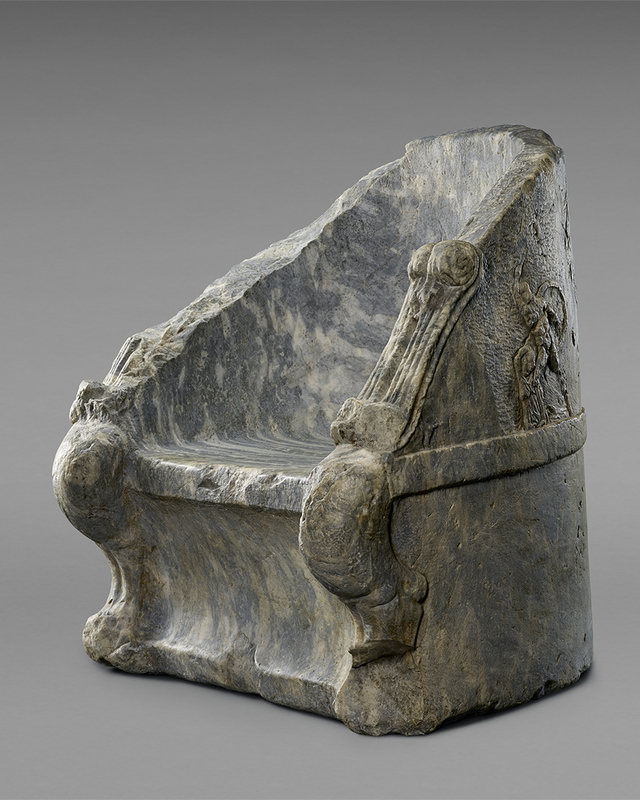 For example, the drawing above of the Greek sculpted throne that is now on display in the Collecting Antiquities gallery is evidence that the object’s chain of discovery and modern ownership dates back to the early nineteenth century, when the Estonian Otto von Stackelberg drew it in Athens during his travels in Greece. Larger collections were also often split up at auctions or through institutions exchanging works of art. The Pouring Satyr who commands our attention at the center of the Collecting Antiquities gallery is one of four nearly identical sculptures, all Roman copies of an original bronze prototype by the Greek sculptor Praxiteles. They were found in the seventeenth century outside of Rome in a theater at the imperial villa of Domitian at Castel Gandolfo. For centuries they remained as a group in two major collections. First, the family of Cardinal Flavio Chigi in Rome owned the sculptures; they then sold them to the royal house of Saxony in Dresden. The group was dispersed in 1838, however, when the British Museum received one of the satyrs in exchange for plaster casts of the Parthenon sculptures. The Soviet government seized a second satyr after World War II. In 1999, the latter was restituted to the heirs of the Saxon Royal House in Dresden, who then sold it to the Getty Villa. Research into Nazi-era provenance issues has gained momentum in recent years, seeking to provide rightful restitution to owners who lost works of art during World War II. Objects in and near the Collecting Antiquities gallery attest to the power of provenance research and documentation in recovering art. 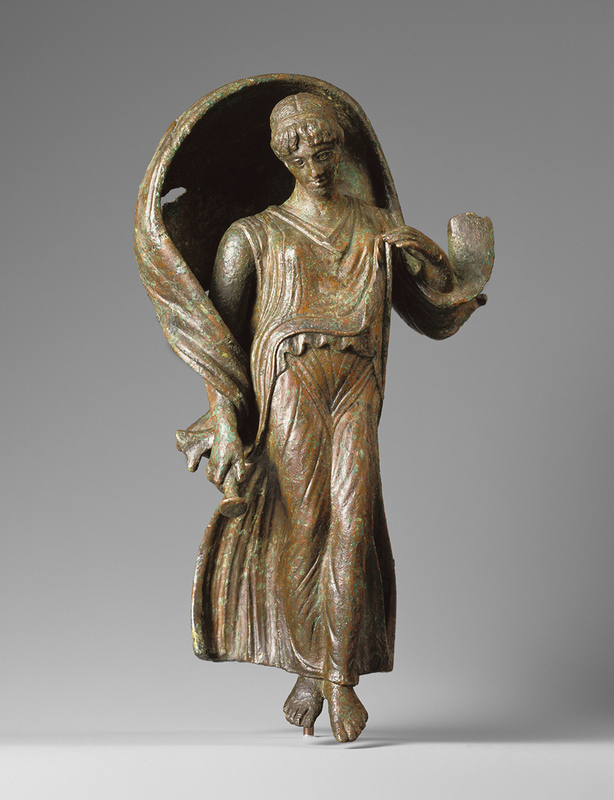 The darker side of the history of collecting is apparent in a small bronze figure of a draped woman, perhaps the goddess Nyx, once owned by the German industrialist Friedrich Ludwig von Gans. In 1940, the Netherlands-based art dealer Kurt Bachstitz sold it to Hans Posse, appointed by Adolf Hitler to build a collection of “Aryan art” for his Führermuseum. The planned museum, part of a larger cultural complex in Hitler’s hometown of Linz, Austria, was never realized, however. In 1947, the bronze statuette was returned to the Netherlands via the Munich Central Collecting Point, an administrative depot set up after World War II to return works of art to their rightful owners. 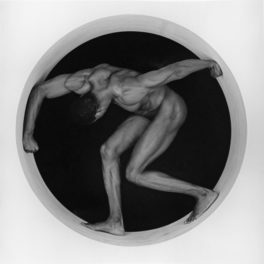 It then passed through several hands before coming to the Getty in 1996. The Nyx statuette is linked to a recent addition to the Getty’s collection, a beautiful carnelian gem depicting Venus and Anchises and on view nearby in the Roman Treasury (Gallery 216). This gem also passed from Gans to Bachstitz before being procured for Hitler’s intended museum. It was then restituted after the war, first to the Netherlands and then to Bachstitz’s heirs, before the Getty Museum acquired it last year. The gem, in turn, is linked to three small cameos that are also on display in the Collecting Antiquities gallery (depicting a woman, Cupids, and a hermaphrodite), all of which were once part of the nineteenth-century Marlborough collection. As demonstrated by the bronze statuette and the gem depicting Venus and Anchises, provenance research makes it possible to tie together the threads of different objects’ histories, weaving their overlapping stories into various narrative arcs. By tracing the provenance of objects we can also piece together the histories of old, now-dispersed collections. The relief with the soothsayer Calchas on the back wall of the Collecting Antiquities gallery once belonged to the famous Lansdowne collection of sculpture. 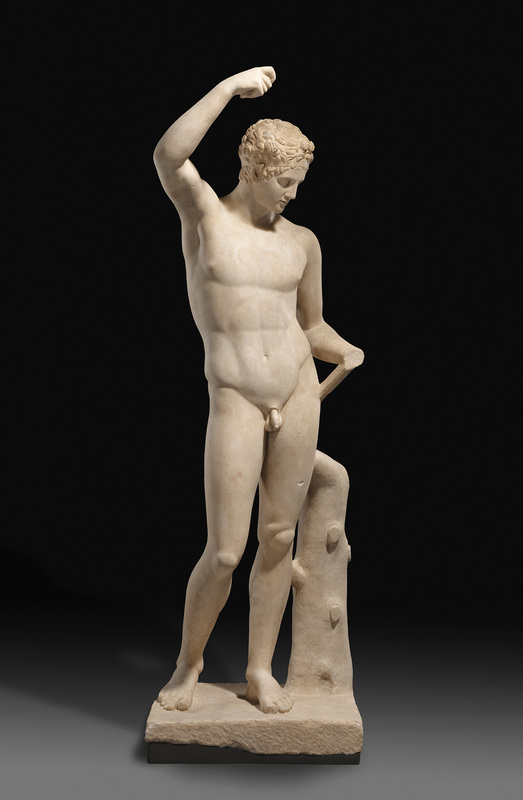 Mr. Getty acquired it in 1972, 20 years after he obtained another object from the same collection: his favorite statue of Herakles. For years after the initial auction of the Lansdowne collection in 1930, the Calchas relief languished in the Orangery at Bowood House, the Lansdowne family’s country estate, with other sculptures that did not sell. 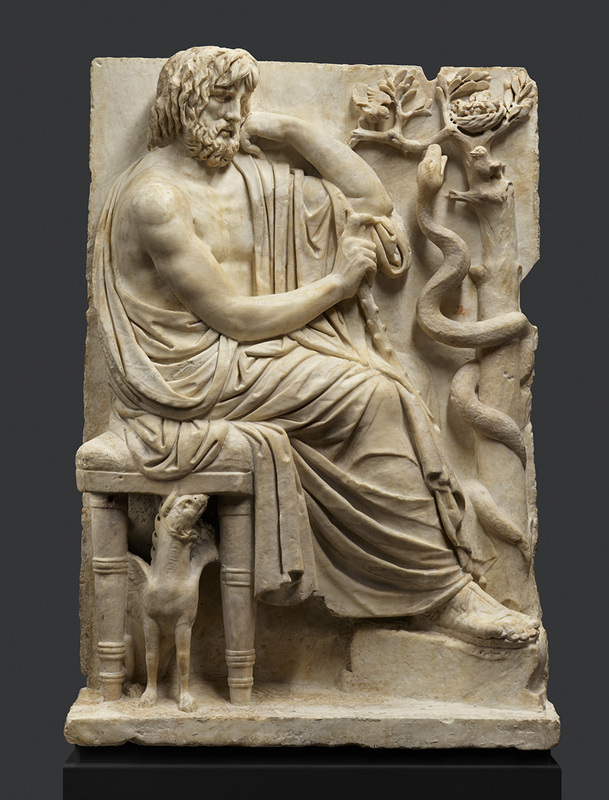 Today, the Herakles statue and the Calchas relief join three others from the Lansdowne collection at the Villa. In fact, a remarkable concentration of sculptures formerly in the Lansdowne collection now resides in Southern California, including works in the Los Angeles County Museum of Art, Hearst Castle, and the Santa Barbara Museum of Art (currently, you can also see two other former Lansdowne statues at the Getty Center on loan from the Santa Barbara Museum of Art). Thanks to laws and regulations that aim to safeguard cultural property, as well as shifts in cultural and ethical attitudes, modern museums approach collecting antiquities much differently than in the past. As with the Getty Villa’s Antiquities Provenance Project, the focus now is primarily on research and documentation of existing collections. Every object’s provenance in the Collecting Antiquities gallery eventually leads, of course, to the Getty Villa, where you can see these ancient artworks on display. I encourage you to delve into their provenance histories, which help us learn more about their long, fascinating stories that stretch from ancient times up until the present day. 1. David Saunders, Judith Barr, and Nicole Budrovich, “The Antiquities Provenance Project at the Getty,” Observations of the Collections Analysis Collaborative 1 (2016): 1–8. 2. Another sculpture once owned by Lord Elgin, a statue of a young kore, is also part of the Getty’s collection and is on display in Archaic and Classical Greece (Gallery 104) on Floor 1 of the Getty Villa. I’m a metadata assistant with the Project for the Study of Collecting and Provenance at the Getty Research Institute. Previously, I was a graduate curatorial intern at the Getty Villa, where I assisted with a number of exhibitions, including Greece’s Enchanting Landscape: Watercolors by Edward Dodwell and Simone Pomardi. My interests include Greek archaeology, antiquities provenance, and digital art history. Fascinating article. These objects continue to live vibrant lives. Thank you for writing Jacquelyn. Thank you, Julie! Yes, that’s very much a point I wanted to drive home: these objects had fascinating uses and stories in antiquity, and by tracing their provenance histories, we can also learn about their lives after discovery. Thank you for reading!